Back home in New Zealand recently for a friend’s wedding I took the opportunity to return to Muritai Yacht Club on the shores of Wellington Harbor. Muritai is where I started sailing P Class and it still exemplifies the renowned, homegrown, kiwi yachting culture. I joined the club at the age of 12 and, despite rare appearances, maintain an active membership and interest in the club’s activities. In 2003 I established a youth training fund by auctioning 10 years worth of sailing gear. Interest earned from the balance is available as a grant to kids participating in national and international events. George Gautry, Tim Coltman, Nichola Trudgen and Leah Trudgen are all past recipients and have gone on to compete overseas with commendable results. To make the most of this visit the club sold tickets, ran a raffle and gave out spot prizes, posters and pins. The AV-savvy members rallied to provide plenty of technology, and we put on a show that would make Oracle and Hartmann Studios proud. For more than an hour I entertained 130 people with stories old and new, slide shows and video, and concluded with a lively discussion on the future of the America’s Cup. With a healthy ratio of kids and cat sailors, there was plenty of positive feedback and the fund received a solid injection for the next wave of aspiring sailors. Special thanks go to Alan Webb, Gilles Martin-Raget, John von Seeburg and Laurent du Roure. 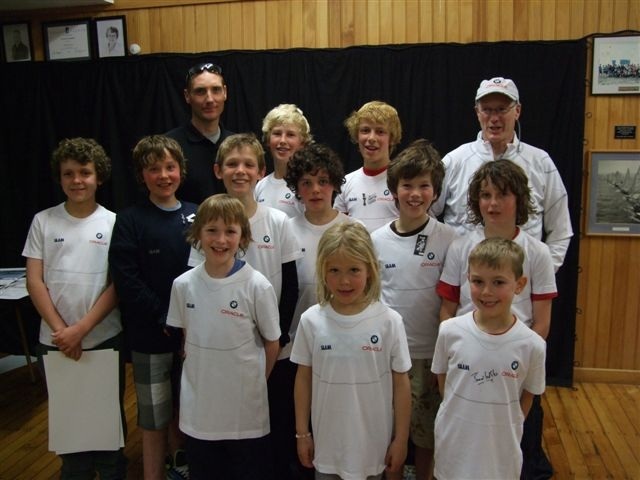 Brad Webb (back left) and youth sailors at the Muritai Yacht Club in Wellington.